The secret to avoiding a puny bun that looks like a cat’s bum? KNOTS! Yes, hairdressers actually encouraged clients to knot their hair, but it looks sooooo good - that perfect I’ve-just-got-up-and-thrown-this-look-together-in-two-minutes vibe you can rock to your Sunday bottomless brunch. Pull your hair into a ponytail and tie it. Then separate into two and tie it in a knot. Keep doing this until you run out of hair, and pin up. So simple, yet so blooming chic it looks Parisienne. It was the first tip we tried the day after, and we love it! Going to a lunchtime gym sesh and have no time to wash your hair afterwards? Simple – pop in a little dry shampoo at the front and – this bit is crucial - at the back by the nape of the neck, and workout with abandon. Then when you get back into the changing room, grab a hairdryer and set it to “cool”, drying on low and using your fingers lightly. This will dry off any sweat-kissed hair that the dry shampoo hasn’t seen to already. Two tips in one here - you’re welcome! 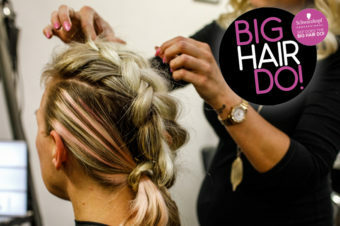 The secret to building a braid with staying power is prep – we kept hearing loving references to Tecni.ART Pli from L’Oreal Professionnel, a backstage favourite at Fashion Week. Dry it into your hair to give you grip. Then once you’ve braided, gently twiddle (yes, that’s the technical term) your plait ONE PIECE AT A TIME. You’re looking to pull it apart ever so slightly, to make it wider and a bit more cool and a bit less school prefect. You can always go back and twiddle a bit more. Then a quick once over with hairspray and it will last the day. Always wanted to know what you’d look like with flashes of fantasy shades in your hair, but don’t want to actually colour your hair? We’ve got just the thing: hair extensions. 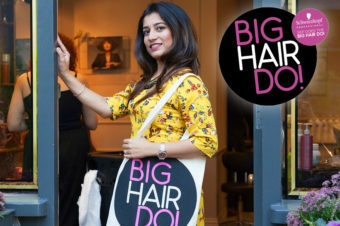 Clients at the Big Hair Do loved trying Great Lengths’ more ‘out-there’ shades, from candyfloss to a gorgeous peacock blue – especially when shown how quick and easy they were to apply. They’re simply wrapped around a small section of hair and secured using a Great lengths application machine. Et voila! Fashion-forward shades, without the damage or bleach. When using a curling wand or tong, experiment with the way you loop your hair around the barrel for varying results. The wider the space between your looped hair, the looser and more natural the wave created. Twist the hair as you loop it and you’ll get a tighter, more textured curl. Closely looping hair will create a more classic ribbon curl. And the best way to “brush” through hair once you’ve waved it? Use a chunky wide tooth comb – you WANT the curls to be loose but not gone, this’ll do the job. Boxer braids look great no matter what you’re doing – whether you’re going to the gym or heading out for drinks after work – but they aren’t the easiest to get right. We all know the basics (it’s essentially two French plaits), but actually recreating them is easier said than done. Ever got confused about which section goes where or pulled hair from the wrong section into your plait? We’ve got a nifty trick for that: hair dust or a texturising spray. Work a bit throughout the hair, giving each strand a bit more grip. This makes it far easier to not only divide and section hair, but pulling hair into each section as you work down the head, too. Backcombing might be the quickest way to get some volume in your hair, but it can be damaging (getting those knots out in the morning is never fun). If you’re a regular backcomber then you’ll be pleased to discover it can be done without breaking your hair. First off, buy a specialist backcomb brush, which has soft bristles that won’t break your hair. Then, when backcombing, only go downwards towards your scalp, instead of up and down. Finally, at the end of the night, don’t forget about it! Apply an oil, such as argan, to smooth your hair before gently separating any knots with your fingers. Once it’s separated as much as possible, use a brush to finish detangling. Think you know which colours suit your skin tone and your eyes? Have you ever had your colour read though? You might be surprised! 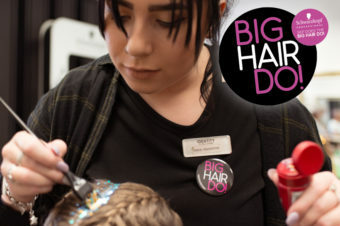 Headmasters offers this service as part of its colour consultations in its salons across the UK, breaking out a colour cape and trying different tones next to your face to see what makes your eyes pop and your skin sparkle. From there, you can not only choose your perfect shades for your hair, but hit up your high street for a new wardrobe to get the most complimentary colours in your wardrobe. Genius! More and more people are choosing to embrace their naturally silver strands - as you can see, grey hair can look amazing with the right care. Make sure that you give it plenty of nourishment, as hair that is grey can be fragile – a strengthening shampoo and plenty of rehydrating masks are a must. Plus, to keep yellowness at bay, make sure you invest in a purple shampoo to neutralise your colour and keep it looking bright and icy. Ask your stylist for a blunt cut to really show off your grey. Half-up, half-down hairstyles are having a bit of a moment. If you’re in a rush, a bit indecisive or just want the best of both worlds then they’re perfect. Why? Well, you only have to style half of your hair, as the other half is going to be scooped up into a bun and pinned, saving you time curling or straightening to your desired texture. Plus, you can be as messy or as neat as you like – a few flyaways are only going to add to the relaxed look, so if styling your own hair isn’t your strength then you’re in good company. And no matter whether your hair is waist length or a bob, it still works – just use the right shade of bobby pin and add some texturising spray for extra oomph!